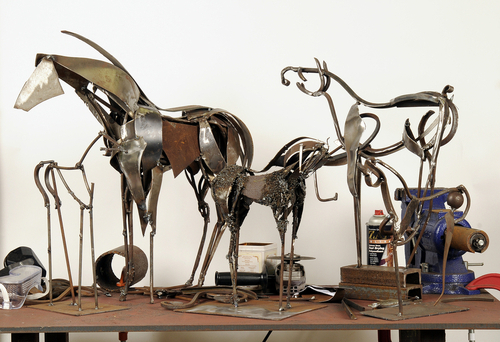 A sculptor of metal horses, Marcia has worked at her art for more than a decade. She grew up in a Midwest equestrian culture, grooming, training and riding horses since early childhood. Her intimate knowledge of the conformation, performance and allure of horses translates seamlessly into authentic sculptural renderings. Though fabricated of found sheet steel scrap, Marcia’s sculpture is seemingly weightless. Often mounted on wood, steel and stone bases, her pieces range from tabletop size to larger than life. In the equestrian community, her works rank among the country’s best. Ms. Spivak created her work in and around her studio in Wilton, CT.
Mr. and Mrs. Paul Aglietti, Bedford, N.Y.